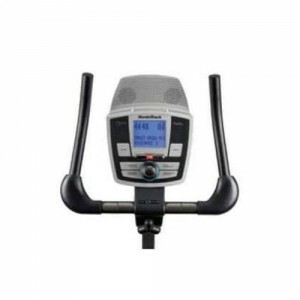 For under £300, the NordicTrack GX3.2 cycle is exceptional value for money. What I really like about the NordicTrack bikes is their innovation and the GX3.2 is no exception to that rule. So if you want an indoor bike that delivers plenty of variance and motivational workouts, I definitely recommend this one. This bike is designed for pretty much all users, whether you’re a regular fitness enthusiast or a beginner. But that doesn’t mean it’s basic. Not at all. With a 10kg flywheel, there’s plenty of resistance, going up to level 20 and it’s very solid with an overall user capacity of 130kg. A very good overall package. NordicTrack are well known for being innovators in the industry and this machine is packed with plenty of ways to bring diversity to your training. In total, there are 23 workouts – not many offer that much variety! And what’s impressive is that each one has its uses, depending on your fitness goals. You can use the personal trainer programs, there’s a heart rate control option and lots more. Really great if you either want to track your goals more easily, boost your motivation, or just try some new things to prevent getting in a cycling rut. Another key selling point for this bike is its iFit SD compatibility. You can buy different iFit SD cards for under £20, all offering different workouts, such as weight loss, wellness, etc. I tried out iFit Circuit Training Level 1. It includes 24 bike workouts, which I think is great value for money. You may also be interested to know that it also includes 24 treadmill and elliptical workouts too. Listening to the certified personal trainer, I was talked through my workout from start to end. This is a great option if you work out harder when a bit of pressure is put on you. This bike offers a very smooth workout. I was surprised by just how smooth it was actually. Compared to other cycles in this price range, I would definitely say it peaked in terms of comfort. My only slight bug bear was with the seat. I ride outside (when the weather’s good!) and for me, the seat was quite wide and big compared to my outdoor bike. However, my wife didn’t agree at all and preferred the wider seat as she felt it made it easier to balance and catered for body movement during her workout. So perhaps it’s just me. The seat is adjustable and padded, so overall delivers on comfort, allowing you to find your ideal position. My only other slight criticism would be about the backlit screen, which I feel is a little too bright. Just a small thing though in an overall very good quality bike. The standard warranty is 1 year parts & labour. However, you can get this extended free of charge to 2 years if you register it with Nordic Track by warranty card or via their website within 28 days. Overall, a really good value exercise bike in this price range, offering comfort and an exceptional range of workouts to vary your workout. At this price, it’s one of the best on the market. The C7 ZL is the premium model from the NordicTrack range. It is designed for both regular fitness enthusiasts and beginners alike. 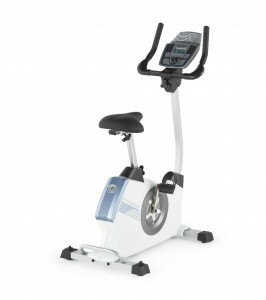 Packed full of features, at the £300 price point it can currently be found at, it provides stiff competition to the alternatives in the mid range of home exercise bikes. Starting with the 12kg true balanced rotating flywheel and the electronic, magnetic braking system, there is an ultra smooth feel to it and loads of resistance. There are up to 25 levels in all which will provide a challenge for even the fittest individuals. The C7 is a solid unit, weighing in at 50kg with a fairly typical footprint of 100cm length by 70cm wide. Transportation wheels on the front stabiliser and a lifting handle on the rear make this cycle a portable option and it feels capable of handling the maximum user weight of 130kg. The seat is quite large and gel filled although perhaps a little hard when compared to the Vision Fitness E1500 or the York C301 Diamond bikes which are the alternatives at this level from a price perspective. The seat is fully height adjustable and can be moved forwards and backwards although the locking mechanism on the height adjustment was a bit fiddly to use. The handlebars can be tilted along with the entire console as one unit which is great if you intend to adopt a lean forward race riding position. The console is where Nordic Track’s innovation really shines through. There are 24 programs including 8 heart rate and 3 watts controlled options. Perhaps the only criticism here would be that despite the numerous preset options, there is no facility to set your own time or distance targets. The lack of user data entry also reduces the accuracy of the feedback provided. These are small gripes however as there are so many preset options which will probably cater for the majority. Heart rate is measured via pulse grips or the included wireless heart rate strap. The LCD screen is back lit and clear with all the basic feedback displayed. There are integrated speakers with mp3 connectivity for those who dislike using headphones and of course, i-Fit SD capability for those requiring more motivation or structure to their workouts. It’s this kind of innovation which keeps Nordic Track at the forefront of exercise equipment technology. The warranty of 2 years parts and labour is Nordic’s standard cover for all of their products. In summary then, if you love gadgets and technology and want bucket load of resistance at a reasonable price then the C7 ZL will definitely qualify. 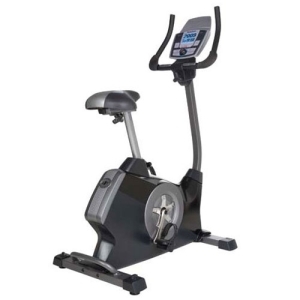 If a little more refinement and build quality are higher on your agenda then there are better suited models out there like the C301 from York or the E1500 from Vision Fitness.